Have you ever actually listened to the "more cowbell" song? I mean all of it. The whole thing. Start to finish. Because if you did you'd suddenly realize that Blue Öyster Cult's "(Don't Fear) The Reaper" is alarmingly deficient in one major ingredient seemingly necessary to assume the mantle as the "more cowbell" song. Which is to say ... it sort of lacks cowbell. Like most people - perhaps not of a certain generation - I was only marginally aware of the song before Saturday Night Live made it wildly famous back in 2000. It was a VH1 Behind the Music sketch where Christopher Walken portrays THE Bruce Dickinson who urges Will Ferrell (as fictitious Gene Frenkle) to really explore the studio space with "more cowbell" during BÖC's recording of "(Don't Fear) The Reaper." 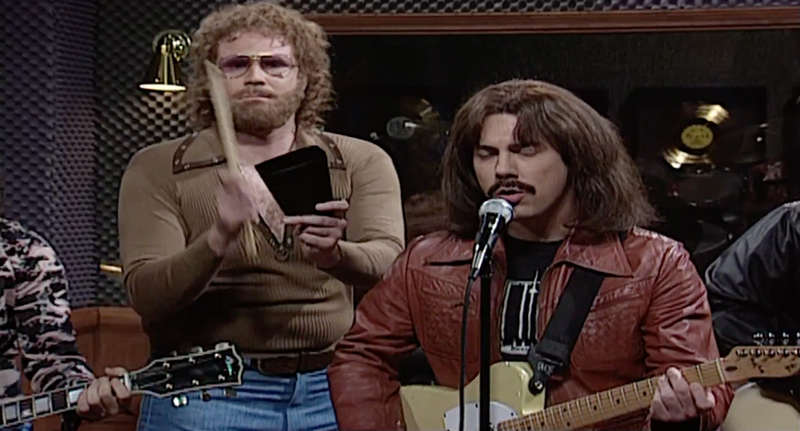 It's regarded as one of the best SNL sketches ever, and the phrase "more cowbell" became a pop culture phenomenon. This was a perfectly acceptable human development, and we all just went on with our lives assuming Bruce Dickinson got his way. "(Don't Fear) The Reaper" must have been the gold standard when it came to cowbell. You see, recently, while I was listening to the album "Animals" by Pink Floyd it occurred to me that the song "Pigs (Three Different Ones)" was particularly heavy with cowbell. And I began to wonder - as one does when he should be doing actual work - which song has MORE COWBELL? I started, first, with "(Don't Fear) The Reaper." Having never actually listened to the whole song beyond the SNL sketch, I figured it was a worthwhile endeavor and I was actually rather excited to hear it in full. 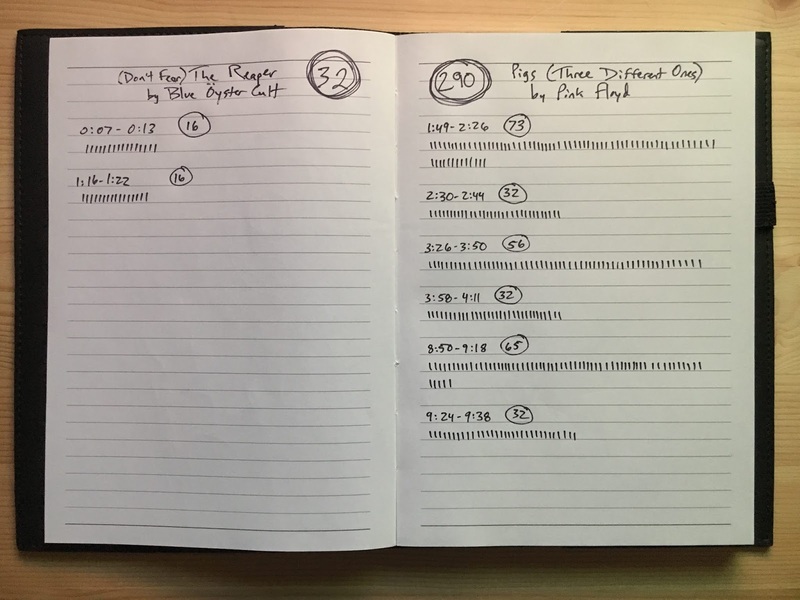 Thus, with an open notebook and pen, I quickly marked hashes as I counted every strike of the cowbell. Now, while this IS a great song, it's worth noting that the mix is a bit muddy. But I'm still sticking with 32. In fact, as best as I can hear, it seems the entire track only has two sections that even feature cowbell. Sixteen strikes each. And THAT, my friends, is NOT more cowbell. Rather shocked, I then turned to "Pigs (Three Different Ones)." The song is eleven-and-a-half minutes long. Which should've been my first indication that the crowning of a new cowbell king would surely end in a Pink Floyd landslide. But I ran the experiment anyway, and counted (as accurately as I could) every cowbell strike. THIS is how you achieve more cowbell! The first of six cowbell segments kicks in at 1:49 and sets the tone with 73 strikes. And then we go in and out of cowbell as the song changes. The only real significant break lasts from about 4:11 to 8:50 when, presumably, a frustrated Roger Waters hid the cowbell so drummer Nick Mason would have to wander around the studio looking for it like a musical afikomen. So, let it be known. While funny and deserving of its stature among the show's finest moments, SNL's take on "(Don't Fear) The Reaper" led us all astray. The song is a fraud. As far as I'm concerned, "Pigs (Three Different Ones)" is the true king of cowbell. And I'm certain of this because I wasted actual minutes of my life finding out. Minutes that I can never have back. But now I know. And I can resume sleeping at night. For all I know, one of these might just be the one cowbell song to rule them all. I simply don't have time to run the numbers. I mean... I do. I'm just not going to. I have tons of other pointless tasks to check off the list and distract me from my regularly scheduled wallowing in self doubt. But if you want to take a stab at it - be my guest. And if any of these songs (or others) can top 290, let me know on Twitter. Or, you know, do literally anything else with your time. * One friend swears that "(Don't Fear) The Reaper" has cowbell throughout the ENTIRE song. Start to finish. But it's just too low in the mix to be easily heard. Even IF this is true, it begs the question, if a tree falls in the woods and nobody is around to hear it, did it make a sound? I submit the answer is no. If I can't hear the cowbell, the cowbell did not make a sound. ** Another friend challenged "Pigs (Three Different Ones)" wasn't a fair comparison because of the length of the song. So, we have to do some math and consider average cowbell strikes per minute. "Reaper" scores 6.4 strikes per minute. And "Pigs" scores 25 strikes per minute. Thus, "Pigs" still reigns supreme. Dude, the best cowbell song of all Time is Mississippi Queen NY Mountain. Sure it doesn't have as many strikes, but it damn sure sets the tone.